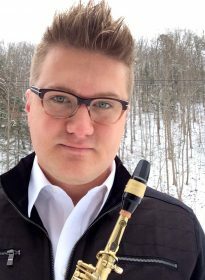 Beginning in August of 2018, Dr. Matthew Taylor will serve as Assistant Professor of Music – Saxophone at the University of Central Arkansas. He returns to his alma mater following five years on the faculty at Morehead State University, where he also serves as the Music Program Coordinator. His multifaceted performance career has taken him all over the world to work with Grammy, Tony, Emmy and Oscar award winning artists. As a soloist, he is an advocate for living composers, and is responsible for many commissions and over 50 world premieres within the past 10 years alone. When he is not on stage, Matt is most fulfilled spending time with students–teaching, giving masterclasses, coaching student ensembles, and participating in residencies in public high schools and at universities.